Bakonycsernye (in Slovakian: Cerna) is a village in Fejér county in Hungary near to Town of Mór (15 km west) in the Gaja Valley of the Bakony Mountains. The village has got 3189 inhabitants (2001 census), nearly all of them are Hungarian, only 38 (1,2%) Slovakian, 12 (0,4%) Gipsy and 7 (0,2%) German by ethnicity. Two of the Official Ethnic Minorities of Hungary has got ethnic council in the village: Slovaks and gypsies. Neighbouring settlements are Súr, Szápár, Jásd, Tés, Isztimér, Balinka and Nagyveleg villages. Symbolism of the Coat of Arms: The hills relate to the Bakony Mountains, the castle on the hill relates to the medieval castle 'CSIKLINGVÁR' on the top of the hill. The seven starts relate to the medieval settlements on the territory of the village, the silver wavy stripe relates to the Gaja brook and the oak branch relates to the forest of the Bakony Mountains. The coat of arms and the flag was adopted in 1997. 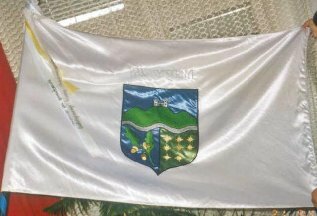 The flag is white, on the center there is a coat of arms of the village. Ratio 2:3. Sources: Photo taken by me in the Mayor's Office of the municipality. Historical data and coat of arms from <www.freeweb.hu/csernyin>, <www.morpont.hu/k_csernye.htm> and <bakonyalja.fejer.hu/bakonycsernye>.